The Cathedral of Intercession of Theotokos on the Moat, popularly known as the Cathedral of Basil the Blessed, is a Russian Orthodox cathedral erected on the Red Square in Moscow in 1555–1561. Built on the order of Ivan IV of Russia to commemorate the capture of Kazan and Astrakhan, it marks the geometric center of the city and the hub of its growth since the 14th century. 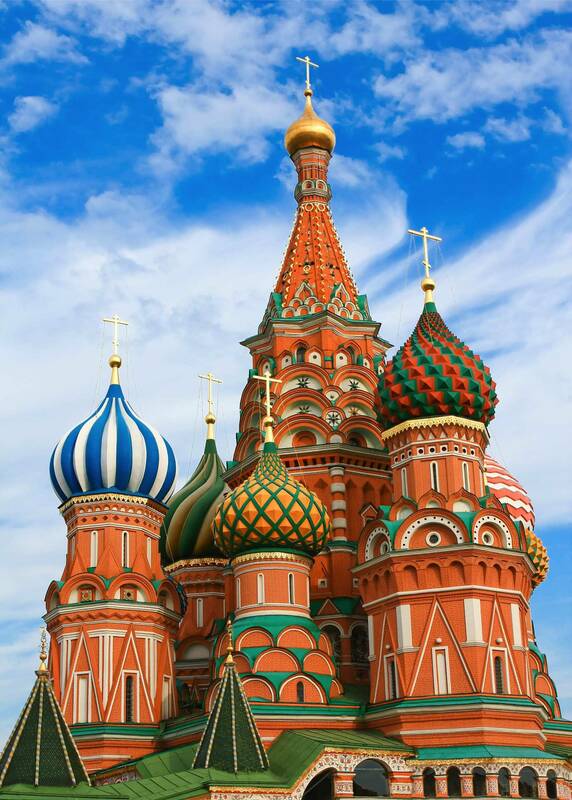 It was the tallest building of Moscow until the completion of the Ivan the Great Bell Tower in 1600. The original building, known as Trinity Church and later Trinity Cathedral, contained eight side churches arranged around the ninth, central church of Intercession; the tenth church was erected in 1588 over the grave of venerated local Fool Vasily (Basil). In the 16th and the 17th centuries the cathedral, perceived as the earthly symbol of the Heavenly City, was popularly known as the Jerusalem and served as an allegory of the Jerusalem Temple in the annual Palm Sunday parade attended by the Patriarch of Moscow and the tsar. The building's design, shaped as a flame of a bonfire rising into the sky, has no analogues in Russian architecture. The cathedral foreshadowed the climax of Russian national architecture in the 17th century but has never been reproduced directly. The cathedral has operated as a division of the State Historical Museum since 1928. It was completely secularized in 1929 and, as of 2009, remains a federal property of the Russian Federation. 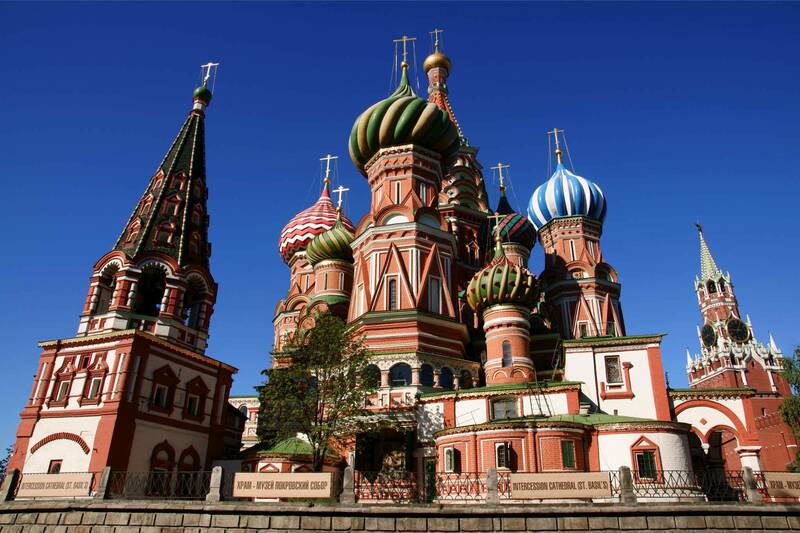 The cathedral has been part of the Moscow Kremlin and Red Square UNESCO World Heritage Site since 1990. Instead of literally following the original ad hoc layout (seven churches around the central core), Ivan's architects opted for a symmetrical floorplan with eight side churches around the core, producing "a thoroughly coherent, logical plan" despite the erroneous latter "notion of a structure devoid of restraint or reason" influenced by the memory of Ivan's irrational atrocities. The central core and the four larger churches placed on compass points are octagonal, the four diagonally placed smaller churches are cuboid although their shape is barely visible through later additions. The larger churches firmly stand on their massive foundations, while the smaller ones were placed on a raised platform, as if hovering above ground. Although the side churches are arranged in perfect symmetry, the cathedral as a whole is not. The larger central church was deliberately offset to the west from the geometric center of the side churches, to accommodate its larger apse on the eastern side. As a result of this subtle calculated asymmetry viewing from north and south presents a complex multi-axial shape while the western facade, facing the Kremlin, appears properly symmetrical and monolithic. The latter perception is reinforced by fortress-style machicolation and corbeled cornice of the western church of Entry into Jerusalem, mirroring real fortifications of the Kremlin. Inside the cathedral is a labyrinth of narrow vaulted corridors and vertical cylinders of the churches. The largest, central church of the Intercession is 46 meters tall internally but has a floor area of only 64 square meters. Nevertheless, it is wider and more "airy" than the church in Kolomenskoye with its exceptionally thick walls. The corridors functioned as internal parvises; the western corridor, adorned with a unique flat caissoned ceiling, doubled as the narthex. The detached belfry of the original Trinity Cathedral stood south-west or south from the main structure. Late 16th and early 16th century plans depict a simple structure with three roof tents, most likely covered with sheet metal. No buildings of this type survived to date, although it was then common and used in all pass-through towers of Skorodom. August von Meyerberg's panorama (1661) presents a different building, with a cluster of small onion domes. The cathedral acquired its present-day vivid colours in several stages from 1680s to 1848. Russians' attitude to colour in the 17th century changed in favor of bright colours; icon and mural art experienced an explosive growth in number of available paints, dyes and their combinations. The original colour scheme, missing these innovations, was far less challenging. Twenty-five seats of the Revelation were recreated literally: by adding eight small onion domes around the central tent, four around the western side church and four elsewhere, the builders indeed created a church with twenty-five crowns of gold; this arrangement survived through most of 17th century. Walls of the cathedral mixed bare red brickwork or painted imitation of bricks with white ornaments, in roughly equal proportion. The domes, covered with tin, were uniformly gilded, creating an overall bright but fairly traditional combination of white, red and golden colours. Moderate use of green and blue ceramic inserts provided a touch of rainbow as prescribed by the Bible. While historians agree on the colour of the 16th century domes, their shape is disputed. Boris Eding wrote that they, most likely, were of the same onion shape as present-day domes. However, both Kolomenskoye and Dyakovo churches have flattened hemispherical domes, and the same type could have been used by Barma and Postnik. In the first years after World War II restorators restored the historical ground floor arcades and pillars that supported the first floor platform, cleared up vaulted and caissoned ceilings in the galleries, and removed "unhistoric" 19th century oil paint murals inside the churches. Another round of repairs, led by Nikolay Sobolev in 1954–1955, restored original paint imitating brickwork, and allowed restorators to actually dig inside old masonry, revealing the wooden frame inside it. In the 1960s, tin roofing of the domes was replaced with copper. 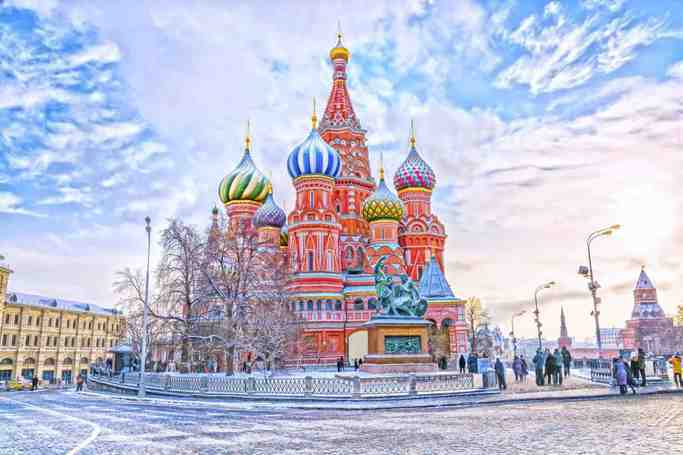 Saint Basil's Cathedral | eTips Inc.